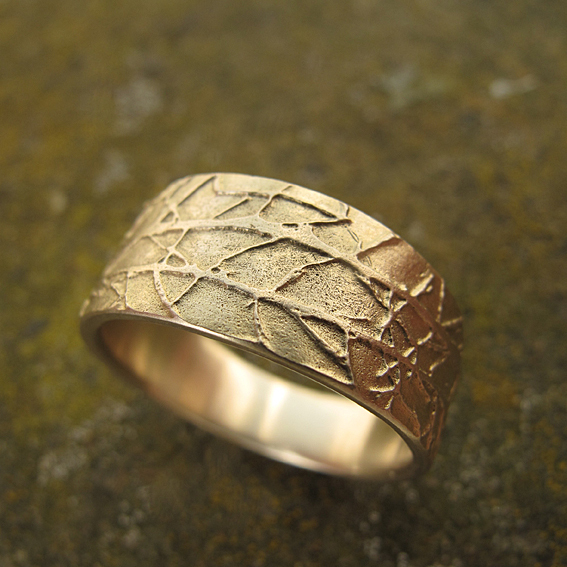 Handmade jewellery including wedding and engagement rings, designed and created in my workshop near Edinburgh in Fife. New collection coming soon. With an emphasis on architectural forms and graphic imagery, my new collection marks a new phase in the direction of my work. Please join my mailing list to be informed of the launch. We commissioned Sally to design and make both our wedding rings and an engagement ring for me - if I say I ended up commissioning another ring and also buying a pair of earrings from Sally soon after, that will give a good sense of the Sally Grant fan I became! Throughout the process of considering design and key practical considerations such as stones, settings and which precious metal to use, Sally was incredibly generous with her creativity, expertise and time in guiding us through the whole process. Commissioning your wedding rings is so very different from buying ‘off-the-shelf’ - it gives you an entirely personalised experience in relation to one of the key parts of any wedding - the rings that signify the commitment you have made which you will wear every day. Sally consistently went ‘the extra mile’ in the guidance and support she provided - for example, she made a copy in silver of the design for the platinum wedding ring I eventually commissioned, so that I could have it to wear for several weeks before reaching my final decision. Please get in touch if you have an enquiry about my jewellery and pricing or if you would like to discuss a commission. Thank you for your enquiry. I'll be in touch.